This was our 4th day at Mount Desert Island and we had moved on to a motel from camping. What a relief! LOL. 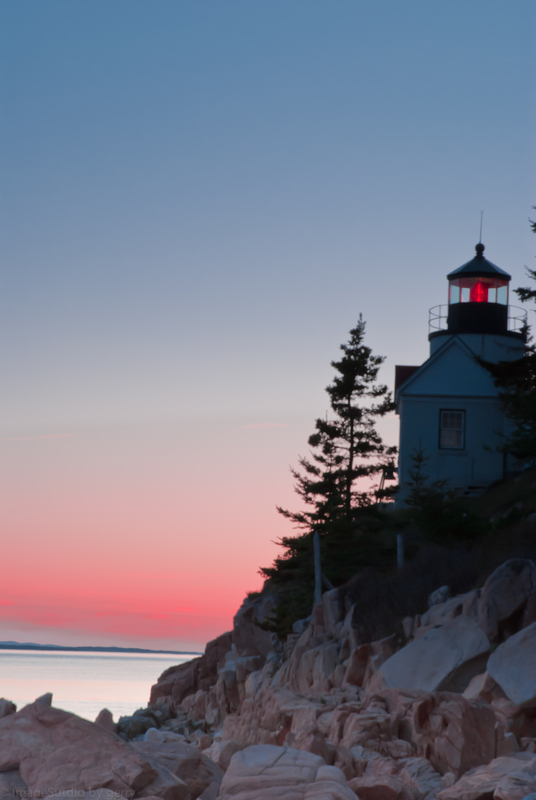 Bass Harbor Lighthouse was a little difficult to shot because first you have to find a good position among huge uneven boulders, second I had to carry all my equipment to the location and third it was dawn therefore it was getting dark. There was a short trail leading to this area but to get this shot I had to move closer to the water on to huge rocks. I was looking forward to shooting this lighthouse cause it’s the only lighthouse on the island and it’s also my first time photographing a working lighthouse. I had fun shooting this photo and I hope you guys like it. Happy viewing! As always please leave comments/questions. I was amazed at the colors of this photograph. This was our last day of camping at Acadia National Park. This photo was taken at Jordan Pond while hiking around the perimeter of the pond. It was nice bright sunny day and I was amazed at how blue the sky was. I like the sweeping subtle cloud around the mountain and also how the blue sky reflected off the water. Enjoy and please leave questions/comments. 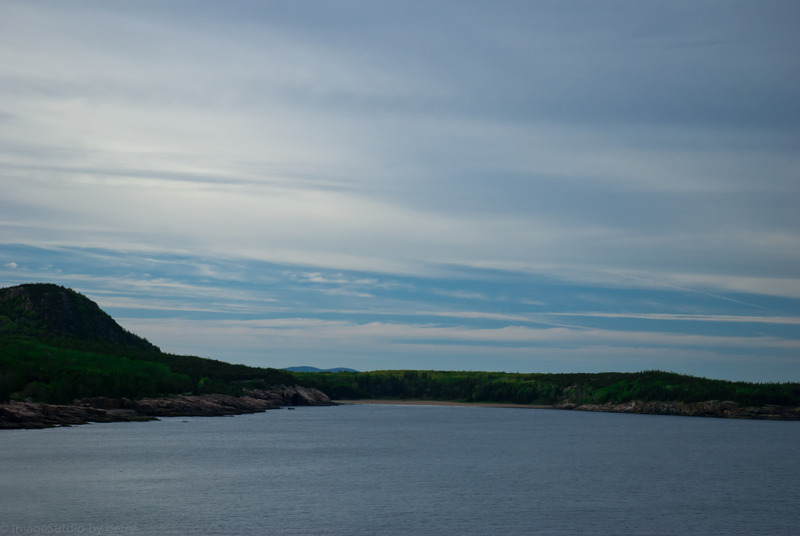 This was my first time visiting Mount Desert Island and Acadia National Park. 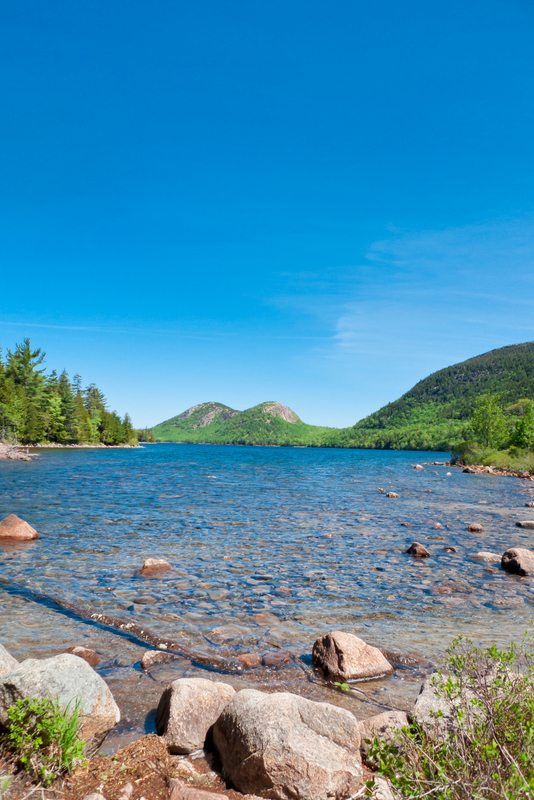 This photo was taken on our first day at Acadia National Park, it was a nice sunny and cool day. We were on a hiking trail called The Ocean Trail and the picture was of Sand Beach. This beach was interesting cause you see a lot of people on the beach but no one really goes for a swim in the water because the water is cold (<60F even in the summer time). I’m still in Maine and taking lots of photo to share with you. Remember this photo was just the first day of the trip, so watch out for more updates. Please leave comments and suggestions. I shot this photograph while I was visiting my parents this past winter. This was my first time photographing the city of Atlanta. It’s a great city surrounded by quaint little neighborhoods. 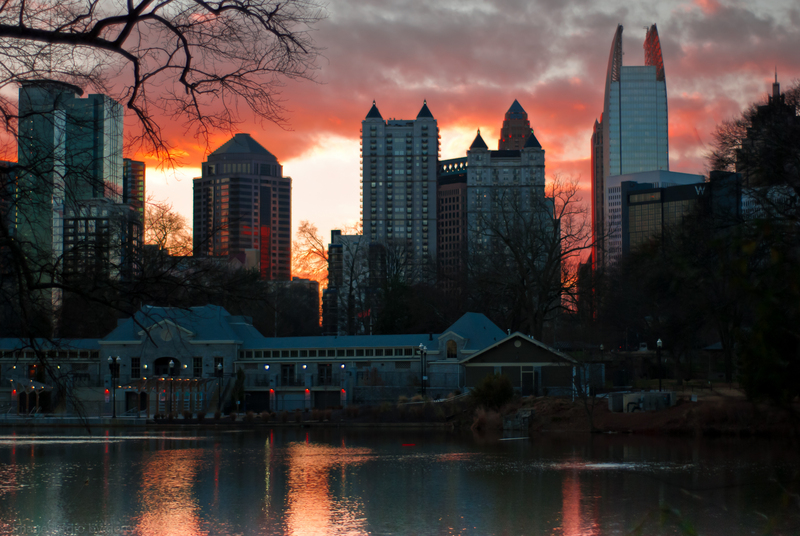 We were walking around Piedmont Park during a cloudy grey day and all of a sudden the color of the sky turned to this bright orange just before sunset. I just had to take a photo. I didn’t have my tripod so I was trying to figure out a way to stabilize my camera. I tried different settings and from a bunch of shots this was the best one. I don’t have vibration reduction on my 50mm lens, however I learned a technique from a workshop at B&H to rest your right elbow on to your rib/stomach area while holding the camera, then exhale and press the shutter. I took this photo with a 50mm prime lens because I was experimenting with just using one focal length for the whole day. It’s interesting experiment because you really have to move around your subject since there was no zoom, use different angles, different perspective and it really ignited my creativity. This lens was amazing, very crisp, and very fast. Near by Piedmont Park was this neighborhood called Virginia Highland. It’s nice neighborhood full of young and hip folks with a large variety of shops, restaurants and a active nightlife. I hope you like the photograph as much as I enjoyed making it. Happy viewing! As always please leave questions and comments. I went for a walk at the High Line this week after a workshop at the Apple store. My DSLR is currently being serviced so I have my little Lumix LX-3 which is a great little camera that shoots RAW pictures. It was a sunny but chilly day, a great day to fly a kite. The High Line was full of spring flowers and people having lunch and just enjoying the nice chilly spring day. Hope you enjoy the pics. Let me know what you think of the pictures. Have a good one. I love going to places that I’ve never been. And this picture was no different. This was my first time visiting Tennessee and the picture was taken in a little town called Gatlinburg. This town was located at the foot of The Great Smoky Mountain National Park. There were lots of little shops and restaurants in town and it was also minutes away from Dollywood. I took this picture mid to late January that is why there were no people around but the great part was the Donut Friar was still open. They made fresh donuts every morning and it was yummy. Gatlinburg was a great little town to charge up for a full day of hiking at the Great Smoky Mountain National Park. I love the lines and the color combinations in this picture. 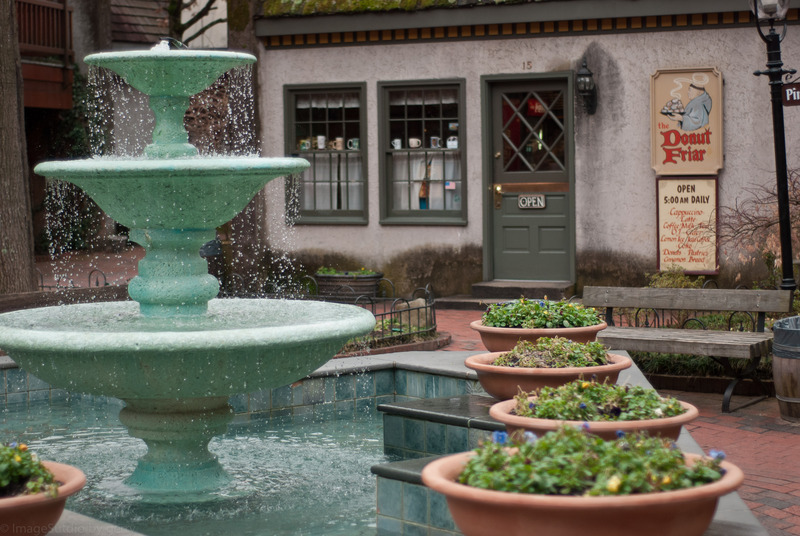 I also like the movement of the water in the fountain and the red color of the The Donut Friar sign in the background. I hope you like it. Please leave me some comments and/or questions. Happy viewing! I don’t usually shoot photos with people or animals. But I just love this picture. I volunteer for Puppies Behind Bars, which trains drug and bomb detection dogs and psychological service dogs for veterans with PTSD. The amazing part of this program is that the dogs are trained and raised in prison. Dogs are matched with a prisoner who raises them for 12-18 months As a result of the hands-on training, these dogs are very well behaved, trusting and very sweet. On weekends, volunteers, like me, socialize the dogs by taking them around the city. They have service jackets, so they can go places other dogs can’t, like museum, buses and stores. Annabel, the dog in the picture is a 6 month old black lab. 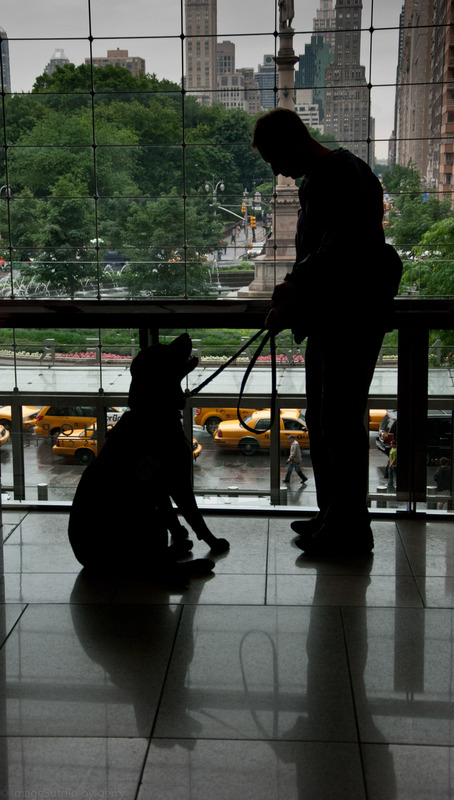 The volunteer and the pup were walking around the Time Warner Center and Annabel is curious, but reserved. This photo captures how focused the volunteer and Annabel are on each other. I love this picture because it shows the bond between the pup and the volunteer. I hope you like the picture as much as I do. Please leave me comments and/or questions.